Diatoms (diá-tom-os 'cut in half', from diá, 'through' or 'apart'; and the root of tém-n-ō, 'I cut'.) are a major group of algae, specifically microalgae, found in the oceans, waterways and soils of the world. Living diatoms number in the trillions: they generate about 20 percent of the oxygen produced on the planet each year, take in over 6.7 billion metric tons of silicon each year from the waters in which they live, and contribute nearly half of the organic material found in the oceans. The shells of dead diatoms can reach as much as a half mile deep on the ocean floor, and the entire Amazon basin is fertilized annually by 27 million tons of diatom shell dust transported by east-to-west (easterly) transatlantic winds from the bed of a dried up lake once covering much of the African Sahara. SAR: a clade or supergroup that includes stramenopiles (heterokonts), alveolates, and Rhizaria. Diatoms are unicellular: they occur either as solitary cells or in colonies, which can take the shape of ribbons, fans, zigzags, or stars. Individual cells range in size from 2 to 200 micrometers. In the presence of adequate nutrients and sunlight, an assemblage of living diatoms doubles approximately every 24 hours by asexual multiple fission; the maximum life span of individual cells is about six days. Diatoms have two distinct shapes: a few (centric diatoms) are radially symmetric, while most (pennate diatoms) are broadly bilaterally symmetric. A unique feature of diatom anatomy is that they are surrounded by a cell wall made of silica (hydrated silicon dioxide), called a frustule. These frustules have structural coloration due to their photonic nanostructure, prompting them to be described as "jewels of the sea" and "living opals". Movement in diatoms primarily occurs passively as a result of both water currents and wind-induced water turbulence; however, male gametes of centric diatoms have flagella, permitting active movement for seeking female gametes. Similar to plants, diatoms convert light energy to chemical energy by photosynthesis, although this shared autotrophy evolved independently in both lineages. Unusually for autotrophic organisms, diatoms possess a urea cycle, a feature that they share with animals, although this cycle is used to different metabolic ends in diatoms. The study of diatoms is a branch of phycology. Diatoms are classified as eukaryotes, organisms with a membrane-bound cell nucleus, that separates them from the prokaryotes archaea and bacteria. Diatoms are a type of plankton called phytoplankton, the most common of the plankton types. Diatoms also grow attached to benthic substrates, floating debris, and on macrophytes. They comprise an integral component of the periphyton community. Another classification divides plankton into eight types based on size: in this scheme, diatoms are classed as microalgae. Several systems for classifying the individual diatom species exist. Fossil evidence suggests that diatoms originated during or before the early Jurassic period, which was about 150 to 200 million years ago. Diatoms are used to monitor past and present environmental conditions, and are commonly used in studies of water quality. Diatomaceous earth (diatomite) is a collection of diatom shells found in the earth's crust. They are soft, silica-containing sedimentary rocks which are easily crumbled into a fine powder and typically have a particle size of 10 to 200 μm. Diatomaceous earth is used for a variety of purposes including for water filtration, as a mild abrasive, in cat litter, and as a dynamite stabilizer. Diagrammatic representation of a diatom. 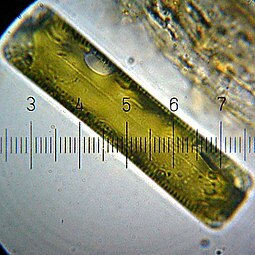 Diatoms are 2 to 200 micrometers in length. Their yellowish-brown chloroplasts, the site of photosynthesis, are typical of heterokonts, having four membranes and containing pigments such as the carotenoid fucoxanthin. Individuals usually lack flagella, but they are present in male gametes of the centric diatoms and have the usual heterokont structure, except they lack the hairs (mastigonemes) characteristic in other groups. Diatoms are often referred as "jewels of the sea" or "living opals" due to their photonic crystal properties. The biological function of this structural coloration is not clear, but it is speculated that it may be related to communication, camouflage, thermal exchange and/or UV protection. Diatoms build intricate hard but porous cell walls called frustules composed primarily of silica. :25–30 This siliceous wall can be highly patterned with a variety of pores, ribs, minute spines, marginal ridges and elevations; all of which can be used to delineate genera and species. The cell itself consists of two halves, each containing an essentially flat plate, or valve and marginal connecting, or girdle band. One half, the hypotheca, is slightly smaller than the other half, the epitheca. Diatom morphology varies. Although the shape of the cell is typically circular, some cells may be triangular, square, or elliptical. Their distinguishing feature is a hard mineral shell or frustule composed of opal (hydrated, polymerized silicic acid). Most diatoms are nonmotile, as their relatively dense cell walls cause them to readily sink. Planktonic forms in open water usually rely on turbulent mixing of the upper layers of the oceanic waters by the wind to keep them suspended in sunlit surface waters. The only mechanism for regulating buoyancy is an ionic pump. Cells are solitary or united into colonies of various kinds, which may be linked by siliceous structures; mucilage pads, stalks or tubes; amorphous masses of mucilage; or by threads of chitin (polysaccharide), which are secreted through strutted processes of the cell. Diatoms are mainly photosynthetic; however a few are obligate heterotrophs and can live in the absence of light provided an appropriate organic carbon source is available. Diatom cells are contained within a unique silica cell wall known as a frustule made up of two valves called thecae, that typically overlap one another. The biogenic silica composing the cell wall is synthesised intracellularly by the polymerisation of silicic acid monomers. This material is then extruded to the cell exterior and added to the wall. In most species, when a diatom divides to produce two daughter cells, each cell keeps one of the two halves and grows a smaller half within it. As a result, after each division cycle, the average size of diatom cells in the population gets smaller. Once such cells reach a certain minimum size, rather than simply divide, they reverse this decline by forming an auxospore. This expands in size to give rise to a much larger cell, which then returns to size-diminishing divisions. Auxospore production is almost always linked to meiosis and sexual reproduction. The exact mechanism of transferring silica absorbed by the diatom to the cell wall is unknown. Much of the sequencing of diatom genes comes from the search for the mechanism of silica uptake and deposition in nano-scale patterns in the frustule. The most success in this area has come from two species, Thalassiosira pseudonana, which has become the model species, as the whole genome was sequenced and methods for genetic control were established, and Cylindrotheca fusiformis, in which the important silica deposition proteins silaffins were first discovered. Silaffins, sets of polycationic peptides, were found in C. fusiformis cell walls and can generate intricate silica structures. These structures demonstrated pores of sizes characteristic to diatom patterns. When T. pseudonana underwent genome analysis it was found that it encoded a urea cycle, including a higher number of polyamines than most genomes, as well as three distinct silica transport genes. In a phylogenetic study on silica transport genes from 8 diverse groups of diatoms, silica transport was found to generally group with species. This study also found structural differences between the silica transporters of pennate (bilateral symmetry) and centric (radial symmetry) diatoms. The sequences compared in this study were used to create a diverse background in order to identify residues that differentiate function in the silica deposition process. Additionally, the same study found that a number of the regions were conserved within species, likely the base structure of silica transport. These silica transport proteins are unique to diatoms, with no homologs found in other species, such as sponges or rice. The divergence of these silica transport genes is also indicative of the structure of the protein evolving from two repeated units composed of five membrane bound segments, which indicates either gene duplication or dimerization. The silica deposition that takes place from the membrane bound vesicle in diatoms has been hypothesized to be a result of the activity of silaffins and long chain polyamines. This Silica Deposition Vesicle (SDV) has been characterized as an acidic compartment fused with Golgi-derived vesicles. These two protein structures have been shown to create sheets of patterned silica in-vivo with irregular pores on the scale of diatom frustules. One hypothesis as to how these proteins work to create complex structure is that residues are conserved within the SDV’s, which is unfortunately difficult to identify or observe due to the limited number of diverse sequences available. Though the exact mechanism of the highly uniform deposition of silica is as yet unknown, the Thalassiosira pseudonana genes linked to silaffins are being looked to as targets for genetic control of nanoscale silica deposition. A feature of diatoms is the urea cycle, which links them evolutionarily to animals. This was discovered in research carried out by Andrew Allen, Chris Bowler and colleagues. Their findings, published in 2011, that diatoms have a functioning urea cycle was highly significant, since prior to this, the urea cycle was thought to have originated with the metazoans which appeared several hundreds of millions of years after the diatoms. Their study showed that while diatoms and animals use the urea cycle for different ends, they are seen to be evolutionally linked in such a way that animals and plants are not. Major pigments of diatoms are chlorophylls a and c, beta-carotene, fucoxanthin, diatoxanthin and diadinoxanthin. Storage products are chrysolaminarin and lipids. Reproduction among these organisms is asexual by binary fission, during which the diatom divides into two parts, producing two "new" diatoms with identical genes. Each new organism receives one of the two frustules - one larger, the other smaller - possessed by the parent, which is now called the epitheca; and is used to construct a second, smaller frustule, the hypotheca. The diatom that received the larger frustule becomes the same size as its parent, but the diatom that received the smaller frustule remains smaller than its parent. This causes the average cell size of this diatom population to decrease. It has been observed, however, that certain taxa have the ability to divide without causing a reduction in cell size. Nonetheless, in order to restore the cell size of a diatom population for those that do endure size reduction, sexual reproduction and auxospore formation must occur. Vegetative cells of diatoms are diploid (2N) and so meiosis can take place, producing male and female gametes which then fuse to form the zygote. The zygote sheds its silica theca and grows into a large sphere covered by an organic membrane, the auxospore. A new diatom cell of maximum size, the initial cell, forms within the auxospore thus beginning a new generation. Resting spores may also be formed as a response to unfavourable environmental conditions with germination occurring when conditions improve. Diatoms are mostly non-motile; however, sperm found in some species can be flagellated, though motility is usually limited to a gliding motion. In centric diatoms, the small male gametes have one flagellum while the female gametes are large and non-motile (oogamous). Conversely, in pennate diatoms both gametes lack flagella (isoogamous). Certain araphid species, that is pennate diatoms without a raphe (seam), have been documented as anisogamous and are, therefore, considered to represent a transitional stage between centric and raphid pennate diatoms, diatoms with a raphe. Diatoms are divided into two groups that are distinguished by the shape of the frustule: the centric diatoms and the pennate diatoms. Pennate diatoms are bilaterally symmetric. Each one of their valves have openings that are slits along the raphes and their shells are typically elongated parallel to these raphes. They generate cell movement through cytoplasm that streams along the raphes, always moving along solid surfaces. Centric diatoms are radially symmetric. They are composed of upper and lower valves - epitheca and hypotheca - each consisting of a valve and a girdle band that can easily slide underneath each other and expand to increase cell content over the diatoms progression. The cytoplasm of the centric diatom is located along the inner surface of the shell and provides a hollow lining around the large vacuole located in the center of the cell. This large, central vacuole is filled by a fluid known as "cell sap" which is similar to seawater but varies with specific ion content. The cytoplasmic layer is home to several organelles, like the chloroplasts and mitochondria. Before the centric diatom begins to expand, its nucleus is at the center of one of the valves and begins to move towards the center of the cytoplasmic layer before division is complete. Centric diatoms have a variety of shapes and sizes, depending on from which axis the shell extends, and if spines are present. Diatoms belong to a large group called the heterokonts, which include both autotrophs such as golden algae and kelp; and heterotrophs such as water moulds. The classification of heterokonts is still unsettled: they may be designated a division, phylum, kingdom, or something intermediate to those. Consequently, diatoms are ranked anywhere from a class, usually called Diatomophyceae or Bacillariophyceae, to a division, usually called Bacillariophyta, with corresponding changes in the ranks of their subgroups. More than 200 genera of living diatoms are known, with an estimated 100,000 extant species. Another systematic approach to classification was proposed in 1995, the Hoek, Mann and Jahns system. Heterokont chloroplasts appear to derive from those of red algae, rather than directly from prokaryotes as occurred in plants. This suggests they had a more recent origin than many other algae. However, fossil evidence is scant, and only with the evolution of the diatoms themselves do the heterokonts make a serious impression on the fossil record. The earliest known fossil diatoms date from the early Jurassic (~185 Ma ago), although the molecular clock and sedimentary evidence suggests an earlier origin. It has been suggested that their origin may be related to the end-Permian mass extinction (~250 Ma), after which many marine niches were opened. The gap between this event and the time that fossil diatoms first appear may indicate a period when diatoms were unsilicified and their evolution was cryptic. Since the advent of silicification, diatoms have made a significant impression on the fossil record, with major fossil deposits found as far back as the early Cretaceous, and with some rocks such as diatomaceous earth, being composed almost entirely of them. Although diatoms may have existed since the Triassic, the timing of their ascendancy and "take-over" of the silicon cycle occurred more recently. Prior to the Phanerozoic (before 544 Ma), it is believed that microbial or inorganic processes weakly regulated the ocean's silicon cycle. Subsequently, the cycle appears dominated (and more strongly regulated) by the radiolarians and siliceous sponges, the former as zooplankton, the latter as sedentary filter-feeders primarily on the continental shelves. Within the last 100 My, it is thought that the silicon cycle has come under even tighter control, and that this derives from the ecological ascendancy of the diatoms. However, the precise timing of the "take-over" remains unclear, and different authors have conflicting interpretations of the fossil record. Some evidence, such as the displacement of siliceous sponges from the shelves, suggests that this takeover began in the Cretaceous (146 Ma to 66 Ma), while evidence from radiolarians suggests "take-over" did not begin until the Cenozoic (66 Ma to present). The expansion of grassland biomes and the evolutionary radiation of grasses during the Miocene is believed to have increased the flux of soluble silicon to the oceans, and it has been argued that this promoted the diatoms during the Cenozoic era. Recent work suggests that diatom success is decoupled from the evolution of grasses, although both diatom and grassland diversity increased strongly from the middle Miocene. Diatom diversity over the Cenozoic has been very sensitive to global temperature, particularly to the equator-pole temperature gradient. Warmer oceans, particularly warmer polar regions, have in the past been shown to have had substantially lower diatom diversity. Future warm oceans with enhanced polar warming, as projected in global-warming scenarios, could thus in theory result in a significant loss of diatom diversity, although from current knowledge it is impossible to say if this would occur rapidly or only over many tens of thousands of years. Diatoms preserved in lake sediments are widely used for paleoenvironmental reconstructions of Quaternary climate, especially for closed-basin lakes which experience fluctuations in water depth and salinity. Although no mass extinctions of marine diatoms have been observed during the Cenozoic, times of relatively rapid evolutionary turnover in marine diatom species assemblages occurred near the Paleocene–Eocene boundary and at the Eocene–Oligocene boundary. Further turnover of assemblages took place at various times between the middle Miocene and late Pliocene, in response to progressive cooling of polar regions and the development of more endemic diatom assemblages. A global trend toward more delicate diatom frustules has been noted from the Oligocene to the Quaternary. This coincides with an increasingly more vigorous circulation of the ocean’s surface and deep waters brought about by increasing latitudinal thermal gradients at the onset of major ice sheet expansion on Antarctica and progressive cooling through the Neogene and Quaternary towards a bipolar glaciated world. This caused diatoms to take in less silica for the formation of their frustules. Increased mixing of the oceans renews silica and other nutrients necessary for diatom growth in surface waters, especially in regions of coastal and oceanic upwelling. In 2002, the first insights into the properties of the Phaeodactylum tricornutum gene repertoire were described using 1,000 expressed sequence tags (ESTs). Subsequently, the number of ESTs was extended to 12,000 and the diatom EST database was constructed for functional analyses. These sequences have been used to make a comparative analysis between P. tricornutum and the putative complete proteomes from the green alga Chlamydomonas reinhardtii, the red alga Cyanidioschyzon merolae, and the diatom Thalassiosira pseudonana. The diatom EST database now consists of over 200,000 ESTs from P. tricornutum (16 libraries) and T. pseudonana (7 libraries) cells grown in a range of different conditions, many of which correspond to different abiotic stresses. In 2004, the entire genome of the centric diatom, Thalassiosira pseudonana (32.4 Mb) was sequenced, followed in 2008 with the sequencing of the pennate diatom, Phaeodactylum tricornutum (27.4 Mb). Comparisons of the two reveal that the P. tricornutum genome includes fewer genes (10,402 opposed to 11,776) than T. pseudonana; no major synteny (gene order) could be detected between the two genomes. T. pseudonana genes show an average of ~1.52 introns per gene as opposed to 0.79 in P. tricornutum, suggesting recent widespread intron gain in the centric diatom. Despite relatively recent evolutionary divergence (90 million years), the extent of molecular divergence between centrics and pennates indicates rapid evolutionary rates within the Bacillariophyceae compared to other eukaryotic groups. Comparative genomics also established that a specific class of transposable elements, the Diatom Copia-like retrotransposons (or CoDis), has been significantly amplified in the P. tricornutum genome with respect to T. pseudonana, constituting 5.8 and 1% of the respective genomes. Diatom genomics brought much information about the extent and dynamics of the endosymbiotic gene transfer (EGT) process. Comparison of the T. pseudonana proteins with homologs in other organisms suggested that hundreds have their closest homologs in the Plantae lineage. EGT towards diatom genomes can be illustrated by the fact that the T. pseudonana genome encodes six proteins which are most closely related to genes encoded by the Guillardia theta (cryptomonad) nucleomorph genome. Four of these genes are also found in red algal plastid genomes, thus demonstrating successive EGT from red algal plastid to red algal nucleus (nucleomorph) to heterokont host nucleus. More recent phylogenomic analyses of diatom proteomes provided evidence for a prasinophyte-like endosymbiont in the common ancestor of chromalveolates as supported by the fact the 70% of diatom genes of Plantae origin are of green lineage provenance and that such genes are also found in the genome of other stramenopiles. Therefore, it was proposed that chromalveolates are the product of serial secondary endosymbiosis first with a green algae, followed by a second one with a red algae that conserved the genomic footprints of the previous but displaced the green plastid. However, phylogenomic analyses of diatom proteomes and chromalveolate evolutionary history will likely take advantage of complementary genomic data from under-sequenced lineages such as red algae. Diatoms are a widespread group and can be found in the oceans, in fresh water, in soils, and on damp surfaces. They are one of the dominant components of phytoplankton in nutrient-rich coastal waters and during oceanic spring blooms, since they can divide more rapidly than other groups of phytoplankton. Most live pelagically in open water, although some live as surface films at the water-sediment interface (benthic), or even under damp atmospheric conditions. They are especially important in oceans, where they contribute an estimated 45% of the total oceanic primary production of organic material. Spatial distribution of marine phytoplankton species is restricted both horizontally and vertically. Planktonic diatoms in freshwater and marine environments typically exhibit a "boom and bust" (or "bloom and bust") lifestyle. When conditions in the upper mixed layer (nutrients and light) are favourable (as at the spring), their competitive edge and rapid growth rate enables them to dominate phytoplankton communities ("boom" or "bloom"). As such they are often classed as opportunistic r-strategists (i.e. those organisms whose ecology is defined by a high growth rate, r). A diagram of the modern oceanic silicon cycle showing the major flows and their magnitudes. The majority of "Biological Production" of biogenic silica in the ocean is driven by diatoms. These extract dissolved silicic acid in surface waters during growth, with this returned by recycling throughout the water column after they die. Inputs of silicon to the ocean from "above" arrive via rivers and aeolian dust, while those from "below" include seafloor sediment recycling, weathering, and hydrothermal activity. Fluxes are shown in Tmol Si y−1 (where 1 Tmol Si y−1 = 28 million metric tons of silicon per year). Diatoms contribute in a significant way to the modern oceanic silicon cycle: they are the source of the vast majority of biological production. The freshwater diatom Didymosphenia geminata, commonly known as Didymo, causes severe environmental degradation in water-courses where it blooms, producing large quantities of a brown jelly-like material called "brown snot" or "rock snot". This diatom is native to Europe and is an invasive species both in the antipodes and in parts of North America. The problem is most frequently recorded from Australia and New Zealand. In the open ocean, the diatom (spring) bloom is typically ended by a shortage of silicon. Unlike other minerals, the requirement for silicon is unique to diatoms and it is not regenerated in the plankton ecosystem as efficiently as, for instance, nitrogen or phosphorus nutrients. This can be seen in maps of surface nutrient concentrations – as nutrients decline along gradients, silicon is usually the first to be exhausted (followed normally by nitrogen then phosphorus). Diatoms are ecologically successful, and occur in virtually every environment that contains water — not only oceans, seas, lakes, and streams, but also soil and wetlands. The use of silicon by diatoms is believed by many researchers to be the key to this ecological success. Raven (1983) noted that, relative to organic cell walls, silica frustules require less energy to synthesize (approximately 8% of a comparable organic wall), potentially a significant saving on the overall cell energy budget. In a now classic study, Egge and Aksnes (1992) found that diatom dominance of mesocosm communities was directly related to the availability of silicic acid — when concentrations were greater than 2 µmol m−3, they found that diatoms typically represented more than 70% of the phytoplankton community. Other researchers have suggested that the biogenic silica in diatom cell walls acts as an effective pH buffering agent, facilitating the conversion of bicarbonate to dissolved CO2 (which is more readily assimilated). More generally, notwithstanding these possible advantages conferred by their use of silicon, diatoms typically have higher growth rates than other algae of the same corresponding size. Diatoms may be obtained from multiple sources. Marine diatoms can be collected by direct water sampling, and benthic forms can be secured by scraping barnacles, oyster and other shells. Diatoms are frequently present as a brown, slippery coating on submerged stones and sticks, and may be seen to "stream" with river current. The surface mud of a pond, ditch, or lagoon will almost always yield some diatoms. Living diatoms are often found clinging in great numbers to filamentous algae, or forming gelatinous masses on various submerged plants. Cladophora is frequently covered with Cocconeis, an elliptically shaped diatom; Vaucheria is often covered with small forms. Since diatoms form an important part of the food of molluscs, tunicates, and fishes, the alimentary tracts of these animals often yield forms that are not easily secured in other ways. Diatoms can be made to emerge by filling a jar with water and mud, wrapping it in black paper and letting direct sunlight fall on the surface of the water. Within a day, the diatoms will come to the top in a scum and can be isolated. Diatoms, and their shells (frustules) as diatomite or diatomaceous earth, are important industrial resources used for fine polishing and liquid filtration. The complex structure of their microscopic shells has been proposed as a material for nanotechnology. Diatoms are also used to help determine the origin of materials containing them, including seawater. The main goal of diatom analysis in forensics is to differentiate a death by submersion from a post-mortem immersion of a body in water. Laboratory tests may reveal the presence of diatoms in the body. Since the silica-based skeletons of diatoms do not readily decay, they can sometimes be detected even in heavily decomposed bodies. As they do not occur naturally in the body, if laboratory tests show diatoms in the corpse that are of the same species found in the water where the body was recovered, then it may be good evidence of drowning as the cause of death. The blend of diatom species found in a corpse may be the same or different from the surrounding water, indicating whether the victim drowned in the same site in which the body was found. The deposition of silica by diatoms may also prove to be of utility to nanotechnology. Diatom cells repeatedly and reliably manufacture valves of various shapes and sizes, potentially allowing diatoms to manufacture micro- or nano-scale structures which may be of use in a range of devices, including: optical systems; semiconductor nanolithography; and even vehicles for drug delivery. With an appropriate artificial selection procedure, diatoms that produce valves of particular shapes and sizes might be evolved for cultivation in chemostat cultures to mass-produce nanoscale components. It has also been proposed that diatoms could be used as a component of solar cells by substituting photosensitive titanium dioxide for the silicon dioxide that diatoms normally use to create their cell walls. Diatom biofuel producing solar panels have also been proposed. The first diatom formally described in scientific literature, the colonial Bacillaria paradoxa, was discovered in 1783 by Danish naturalist Otto Friedrich Müller. Diatoms Chaetoceros spp. on a membrane filter, pore size 0.4 μm. ^ Burki F, Shalchian-Tabrizi K, Minge M, et al. (2007). Butler G (ed.). "Phylogenomics reshuffles the eukaryotic supergroups". PLoS ONE. 2 (8): e790. Bibcode:2007PLoSO...2..790B. doi:10.1371/journal.pone.0000790. PMC 1949142. PMID 17726520. ^ Hampl V, Hug L, Leigh JW, et al. (March 2009). "Phylogenomic analyses support the monophyly of Excavata and resolve relationships among eukaryotic "supergroups"". Proc. Natl. Acad. Sci. U.S.A. 106 (10): 3859–64. Bibcode:2009PNAS..106.3859H. doi:10.1073/pnas.0807880106. PMC 2656170. PMID 19237557. ^ Dumortier, B.-C. (1822). Commentationes botanicae. Observations botaniques, dédiées à la Société d'Horticulture de Tournay Archived 6 October 2015 at the Wayback Machine (disponible at Algaebase). pp. [i], -116, [1, tabl., err.]. Tournay: Imprimerie de Ch. Casterman-Dieu, Rue de pont No. 10. ^ "Definition of DIATOM". www.merriam-webster.com. ^ "King's College London - Lake Megachad". www.kcl.ac.uk. Retrieved 5 May 2018. ^ Bristow, C.S. ; Hudson-Edwards, K.A. ; Chappell, A. (2010). "Fertilizing the Amazon and equatorial Atlantic with West African dust". Geophys. Res. Lett. 37 (14): L14807. Bibcode:2010GeoRL..3714807B. doi:10.1029/2010GL043486. ^ a b c d e f g Grethe R. Hasle; Erik E. Syvertsen; Karen A. Steidinger; Karl Tangen (25 January 1996). "Marine Diatoms". In Carmelo R. Tomas (ed.). Identifying Marine Diatoms and Dinoflagellates. Academic Press. pp. 5–385. ISBN 978-0-08-053441-1. Retrieved 13 November 2013. ^ Wehr, J.D., Sheath, R.G., Kociolek, J.P.(Eds). 2015. Freshwater Algae of North America: Ecology and Classification . San Diego: Academic Press. ^ Parker, Andrew R.; Townley, Helen E. (2007). "Biomimetics of photonic nanostructures". Nature Nanotechnology. 2 (6): 347–53. Bibcode:2007NatNa...2..347P. doi:10.1038/nnano.2007.152. PMID 18654305. ^ Gordon, Richard; Losic, Dusan; Tiffany, Mary Ann; Nagy, Stephen S.; Sterrenburg, Frithjof A.S. (2009). "The Glass Menagerie: Diatoms for novel applications in nanotechnology". Trends in Biotechnology. 27 (2): 116–27. doi:10.1016/j.tibtech.2008.11.003. PMID 19167770. ^ a b c d e Rita A. Horner (2002). A taxonomic guide to some common marine phytoplankton. Biopress. pp. 25–30. ISBN 978-0-948737-65-7. Retrieved 13 November 2013. ^ Anderson, Lars W. J.; Sweeney, Beatrice M. (1 May 1977). "Diel changes in sedimentation characteristics of Ditylum brightwelli: Changes in cellular lipid and effects of respiratory inhibitors and ion-transport modifiers1". Limnology and Oceanography. 22 (3): 539–552. Bibcode:1977LimOc..22..539A. doi:10.4319/lo.1977.22.3.0539. ISSN 1939-5590. ^ "Diatoms". Retrieved 13 February 2016. ^ a b c Thamatrakoln, K.; Alverson, A.J. ; Hildebrand, M. (2006). "COMPARATIVE SEQUENCE ANALYSIS OF DIATOM SILICON TRANSPORTERS: TOWARD A MECHANISTIC MODEL OF SILICON TRANSPORT". Journal of Phycology. 42 (4): 822–834. doi:10.1111/j.1529-8817.2006.00233.x. ^ Kröger, Nils; Deutzmann, Rainer; Manfred, Sumper (November 1999). "Polycationic Peptides from Diatom Biosilica That Direct Silica Nanosphere Formation". Science. 286 (5442): 1129–1132. doi:10.1126/science.286.5442.1129. ^ Kroger, Nils (2007). Handbook of Biomineralization: Biological Aspects and Structure Formation. Weinheim, Germany: Wiley-VCH Verlag GmbH. pp. chapter 3. ^ Allen, Andrew E.; Dupont, Christopher L.; Oborník, Miroslav; Horák, Aleš; Nunes-Nesi, Adriano; McCrow, John P.; Zheng, Hong; Johnson, Daniel A.; Hu, Hanhua; Fernie, Alisdair R.; Bowler, Chris (2011). "Evolution and metabolic significance of the urea cycle in photosynthetic diatoms". Nature. 473 (7346): 203–7. Bibcode:2011Natur.473..203A. doi:10.1038/nature10074. PMID 21562560. Lay summary – Science Daily (12 May 2011). ^ a b G. Drebes (1 January 1977). "Chapter 9: Sexuality". In Dietrich Werner (ed.). The Biology of Diatoms. Volume 13 of Botanical Monographs. University of California Press. pp. 250–283. ISBN 978-0-520-03400-6. Retrieved 14 November 2013. ^ Azam, Farooq; Bidle, Kay D. (1999). "Accelerated dissolution of diatom silica by marine bacterial assemblages". Nature. 397 (6719): 508–12. Bibcode:1999Natur.397..508B. doi:10.1038/17351. INIST:1755031. ^ Zakharova, Yulia R.; Galachyants, Yuri P.; Kurilkina, Maria I.; Likhoshvay, Alexander V.; Petrova, Darya P.; Shishlyannikov, Sergey M.; Ravin, Nikolai V.; Mardanov, Andrey V.; Beletsky, Alexey V.; Likhoshway, Yelena V. (2013). "The Structure of Microbial Community and Degradation of Diatoms in the Deep Near-Bottom Layer of Lake Baikal". PLoS ONE. 8 (4): e59977. Bibcode:2013PLoSO...859977Z. doi:10.1371/journal.pone.0059977. PMC 3613400. PMID 23560063. ^ Mann, David G. (2005). "The species concept in diatoms: Evidence for morphologically distinct, sympatric gamodemes in four epipelic species". Plant Systematics and Evolution. 164 (1/4): 215–37. doi:10.1007/BF00940439. JSTOR 23675282. ^ "Bacillariophyceae". algaebase. M. D. Guiry. Retrieved 11 November 2013. ^ Medlin, Linda K.; Kaczmarska, Irena (2004). "Evolution of the diatoms: V. Morphological and cytological support for the major clades and a taxonomic revision" (PDF). Phycologia. 43 (3): 245–70. doi:10.2216/i0031-8884-43-3-245.1. ^ a b Kooistra, Wiebe H.C.F. ; Medlin, Linda K. (1996). "Evolution of the Diatoms (Bacillariophyta)". Molecular Phylogenetics and Evolution. 6 (3): 391–407. doi:10.1006/mpev.1996.0088. PMID 8975694. ^ Schieber, Jürgen; Krinsley, Dave; Riciputi, Lee (2000). "Diagenetic origin of quartz silt in mudstones and implications for silica cycling". Nature. 406 (6799): 981–5. doi:10.1038/35023143. PMID 10984049. ^ Medlin, L. K.; Kooistra, W. H. C. F.; Gersonde, R.; Sims, P. A.; Wellbrock, U. (1997). "Is the origin of the diatoms related to the end-Permian mass extinction?". Nova Hedwegia. 65: 1–11. hdl:10013/epic.12689. ^ Raven, J. A.; Waite, A. M. (2004). "The evolution of silicification in diatoms: Inescapable sinking and sinking as escape?". New Phytologist. 162 (1): 45–61. doi:10.1111/j.1469-8137.2004.01022.x. JSTOR 1514475. ^ R. Siever; Stephen Henry Schneider; Penelope J. Boston (January 1993). "Silica in the oceans: biological-geological interplay". Scientists on Gaia. MIT Press. pp. 287–295. ISBN 978-0-262-69160-4. Retrieved 14 November 2013. ^ Kidder, David L.; Erwin, Douglas H. (2001). "Secular Distribution of Biogenic Silica through the Phanerozoic: Comparison of Silica‐Replaced Fossils and Bedded Cherts at the Series Level". The Journal of Geology. 109 (4): 509–22. Bibcode:2001JG....109..509K. doi:10.1086/320794. ^ Grenne, Tor; Slack, John F. (2003). "Paleozoic and Mesozoic silica-rich seawater: Evidence from hematitic chert (jasper) deposits". Geology. 31 (4): 319–22. Bibcode:2003Geo....31..319G. doi:10.1130/0091-7613(2003)031<0319:PAMSRS>2.0.CO;2. INIST:14692468. ^ Racki, G; Cordey, Fabrice (2000). "Radiolarian palaeoecology and radiolarites: Is the present the key to the past?". Earth-Science Reviews. 52 (1): 83–120. Bibcode:2000ESRv...52...83R. doi:10.1016/S0012-8252(00)00024-6. ^ Maldonado, Manuel; Carmona, M. Carmen; Uriz, María J.; Cruzado, Antonio (1999). "Decline in Mesozoic reef-building sponges explained by silicon limitation". Nature. 401 (6755): 785–8. Bibcode:1999Natur.401..785M. doi:10.1038/44560. INIST:1990263. ^ Harper, Howard E.; Knoll, Andrew H. (1975). "Silica, diatoms, and Cenozoic radiolarian evolution". Geology. 3 (4): 175–7. Bibcode:1975Geo.....3..175H. doi:10.1130/0091-7613(1975)3<175:SDACRE>2.0.CO;2. ^ Falkowski, P. G.; Katz, Miriam E.; Knoll, Andrew H.; Quigg, Antonietta; Raven, John A.; Schofield, Oscar; Taylor, F. J. R. (2004). "The Evolution of Modern Eukaryotic Phytoplankton". Science. 305 (5682): 354–60. Bibcode:2004Sci...305..354F. CiteSeerX 10.1.1.598.7930. doi:10.1126/science.1095964. PMID 15256663. ^ Kidder, D. L.; Gierlowski-Kordesch, E. H. (2005). "Impact of Grassland Radiation on the Nonmarine Silica Cycle and Miocene Diatomite". PALAIOS. 20 (2): 198–206. Bibcode:2005Palai..20..198K. doi:10.2110/palo.2003.p03-108. JSTOR 27670327. ^ a b Lazarus, David; Barron, John; Renaudie, Johan; Diver, Patrick; Türke, Andreas (2014). "Cenozoic Planktonic Marine Diatom Diversity and Correlation to Climate Change". PLoS ONE. 9 (1): e84857. Bibcode:2014PLoSO...984857L. doi:10.1371/journal.pone.0084857. PMC 3898954. PMID 24465441. ^ Scala, S.; Carels, N; Falciatore, A; Chiusano, M. L.; Bowler, C (2002). "Genome Properties of the Diatom Phaeodactylum tricornutum". Plant Physiology. 129 (3): 993–1002. doi:10.1104/pp.010713. PMC 166495. PMID 12114555. ^ Maheswari, U.; Montsant, A; Goll, J; Krishnasamy, S; Rajyashri, K. R.; Patell, V. M.; Bowler, C (2004). "The Diatom EST Database". Nucleic Acids Research. 33 (Database issue): D344–7. doi:10.1093/nar/gki121. PMC 540075. PMID 15608213. ^ Montsant, A.; Jabbari, K; Maheswari, U; Bowler, C (2005). "Comparative Genomics of the Pennate Diatom Phaeodactylum tricornutum". Plant Physiology. 137 (2): 500–13. doi:10.1104/pp.104.052829. PMC 1065351. PMID 15665249. ^ Maheswari, U.; Mock, T.; Armbrust, E. V.; Bowler, C. (2009). "Update of the Diatom EST Database: A new tool for digital transcriptomics". Nucleic Acids Research. 37 (Database issue): D1001–5. doi:10.1093/nar/gkn905. PMC 2686495. PMID 19029140. ^ a b Armbrust, E. V.; Berges, John A.; Bowler, Chris; Green, Beverley R.; Martinez, Diego; Putnam, Nicholas H.; Zhou, Shiguo; Allen, Andrew E.; Apt, Kirk E.; Bechner, Michael; Brzezinski, Mark A.; Chaal, Balbir K.; Chiovitti, Anthony; Davis, Aubrey K.; Demarest, Mark S.; Detter, J. Chris; Glavina, Tijana; Goodstein, David; Hadi, Masood Z.; Hellsten, Uffe; Hildebrand, Mark; Jenkins, Bethany D.; Jurka, Jerzy; Kapitonov, Vladimir V.; Kröger, Nils; Lau, Winnie W. Y.; Lane, Todd W.; Larimer, Frank W.; Lippmeier, J. Casey; et al. (2004). "The Genome of the Diatom Thalassiosira Pseudonana: Ecology, Evolution, and Metabolism". Science. 306 (5693): 79–86. Bibcode:2004Sci...306...79A. CiteSeerX 10.1.1.690.4884. doi:10.1126/science.1101156. PMID 15459382. ^ a b c d Bowler, Chris; Allen, Andrew E.; Badger, Jonathan H.; Grimwood, Jane; Jabbari, Kamel; Kuo, Alan; Maheswari, Uma; Martens, Cindy; Maumus, Florian; Otillar, Robert P.; Rayko, Edda; Salamov, Asaf; Vandepoele, Klaas; Beszteri, Bank; Gruber, Ansgar; Heijde, Marc; Katinka, Michael; Mock, Thomas; Valentin, Klaus; Verret, Fréderic; Berges, John A.; Brownlee, Colin; Cadoret, Jean-Paul; Chiovitti, Anthony; Choi, Chang Jae; Coesel, Sacha; De Martino, Alessandra; Detter, J. Chris; Durkin, Colleen; et al. (2008). "The Phaeodactylum genome reveals the evolutionary history of diatom genomes". Nature. 456 (7219): 239–44. Bibcode:2008Natur.456..239B. doi:10.1038/nature07410. PMID 18923393. ^ Roy, S. W.; Penny, D. (2007). "A Very High Fraction of Unique Intron Positions in the Intron-Rich Diatom Thalassiosira pseudonana Indicates Widespread Intron Gain". Molecular Biology and Evolution. 24 (7): 1447–57. doi:10.1093/molbev/msm048. PMID 17350938. ^ Maumus, Florian; Allen, Andrew E; Mhiri, Corinne; Hu, Hanhua; Jabbari, Kamel; Vardi, Assaf; Grandbastien, Marie-Angèle; Bowler, Chris (2009). "Potential impact of stress activated retrotransposons on genome evolution in a marine diatom". BMC Genomics. 10: 624. doi:10.1186/1471-2164-10-624. PMC 2806351. PMID 20028555. ^ Moustafa, A.; Beszteri, B.; Maier, U. G.; Bowler, C.; Valentin, K.; Bhattacharya, D. (2009). "Genomic Footprints of a Cryptic Plastid Endosymbiosis in Diatoms" (PDF). Science. 324 (5935): 1724–6. Bibcode:2009Sci...324.1724M. doi:10.1126/science.1172983. PMID 19556510. ^ a b c Furnas, Miles J. (1990). "In situ growth rates of marine phytoplankton: Approaches to measurement, community and species growth rates". Journal of Plankton Research. 12 (6): 1117–51. doi:10.1093/plankt/12.6.1117. INIST:5474600. ^ a b Yool, Andrew; Tyrrell, Toby (2003). "Role of diatoms in regulating the ocean's silicon cycle". Global Biogeochemical Cycles. 17 (4): n/a. Bibcode:2003GBioC..17.1103Y. CiteSeerX 10.1.1.394.3912. doi:10.1029/2002GB002018. ^ Lipps, Jere H. (1970). "Plankton Evolution". Evolution. 24 (1): 1–22. doi:10.2307/2406711. JSTOR 2406711. PMID 28563010. ^ a b Treguer, P.; Nelson, D. M.; Van Bennekom, A. J.; Demaster, D. J.; Leynaert, A.; Queguiner, B. (1995). "The Silica Balance in the World Ocean: A Reestimate". Science. 268 (5209): 375–9. Bibcode:1995Sci...268..375T. doi:10.1126/science.268.5209.375. PMID 17746543. ^ "Didymo Stakeholder Update – 31 October 2008". MAF Biosecurity New Zealand www.biosecurity.govt.nz. Retrieved 1 December 2013. ^ a b Dugdale, R. C.; Wilkerson, F. P. (1998). "Silicate regulation of new production in the equatorial Pacific upwelling". Nature. 391 (6664): 270–273. Bibcode:1998Natur.391..270D. doi:10.1038/34630. ^ Smetacek, V. S. (1985). "Role of sinking in diatom life-history cycles: Ecological, evolutionary and geological significance". Mar. Biol. 84 (3): 239–251. doi:10.1007/BF00392493. ^ a b Egge, J. K.; Aksnes, D. L. (1992). "Silicate as regulating nutrient in phytoplankton competition". Mar. Ecol. Prog. Ser. 83: 281–289. Bibcode:1992MEPS...83..281E. doi:10.3354/meps083281. ^ Milligan, A. J.; Morel, F. M. M. (2002). "A proton buffering role for silica in diatoms". Science. 297 (5588): 1848–1850. Bibcode:2002Sci...297.1848M. doi:10.1126/science.1074958. PMID 12228711. ^ Mishra, M; Arukha, AP; Bashir, T; Yadav, D; Gbks, Prasad (2017). "All New Faces of Diatoms: Potential Source of Nanomaterials and Beyond". Front Microbiol. 8: 1239. doi:10.3389/fmicb.2017.01239. PMC 5496942. PMID 28725218. ^ Auer, Antti (1991). "Qualitative Diatom Analysis as a Tool to Diagnose Drowning". The American Journal of Forensic Medicine and Pathology. 12 (3): 213–8. doi:10.1097/00000433-199109000-00009. PMID 1750392. ^ Bradbury, J. (2004). "Nature's Nanotechnologists: Unveiling the Secrets of Diatoms". PLoS Biology. 2 (10): 1512–1515. doi:10.1371/journal.pbio.0020306. PMC 521728. PMID 15486572. ^ Drum, Ryan W.; Gordon, Richard (2003). "Star Trek replicators and diatom nanotechnology". Trends in Biotechnology. 21 (8): 325–8. doi:10.1016/S0167-7799(03)00169-0. PMID 12902165. ^ Ramachandra, T. V.; Mahapatra, Durga Madhab; b, Karthick; Gordon, Richard (2009). "Milking Diatoms for Sustainable Energy: Biochemical Engineering versus Gasoline-Secreting Diatom Solar Panels". Industrial & Engineering Chemistry Research. 48 (19): 8769–88. doi:10.1021/ie900044j. Wikimedia Commons has media related to Diatoms.